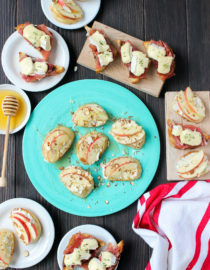 When you go to the farmer’s market this weekend, think of this toast. 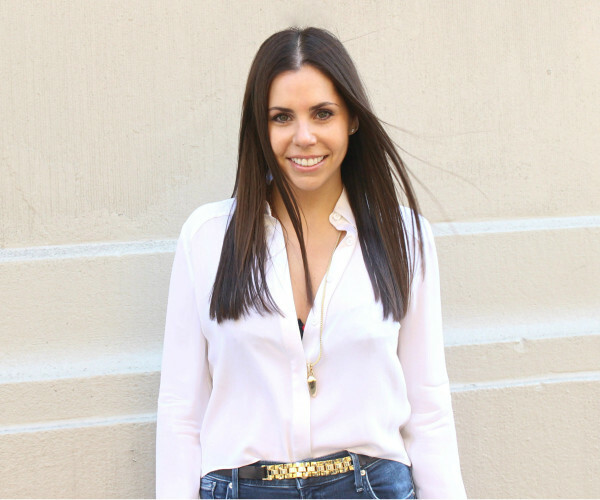 Then go home, make it, Instagram it (duh), and remember to thank me later. As I’ve preached endlessly on these digital pages, toast is basically the perfect food. It’s versatile, it’s creative, it’s EASY, and you can truly eat it whenever you want. 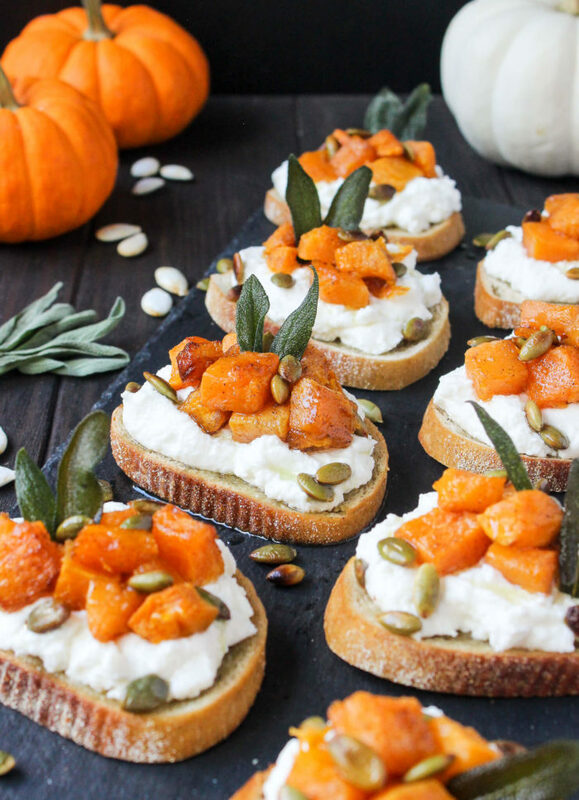 These caramelized butternut & truffle ricotta toasts are particularly functional, in that they work for any myriad of eating opportunities. So if you decide to enjoy these for lunch, that’s fine by me. And if you prep them as an app, that’s even better. Or if you end up feeling unusually lazy and eat TEN of them for dinner (it can happen! )… be my guest. Because when there’s this much flavor + texture on a crispy slice of bread, there’s no wrong way to enjoy it. You start by caramelizing the butternut squash, which is an easy yet mildly time-consuming task. Peel the butternut with a vegetable peeler, then slice into precise 1/2″ cubes. I’ll be clear that slicing butternut requires a VERY sharp knife, so if your knives are from Ikea, take a seat. You can purchase pre-cubed butternut from the grocery store, because otherwise you’re in for a world of aggravation. So depending on your sitch, get the butternut cubed, then toss it in a marinade of coconut oil, brown sugar, cinnamon, and salt & pepper. 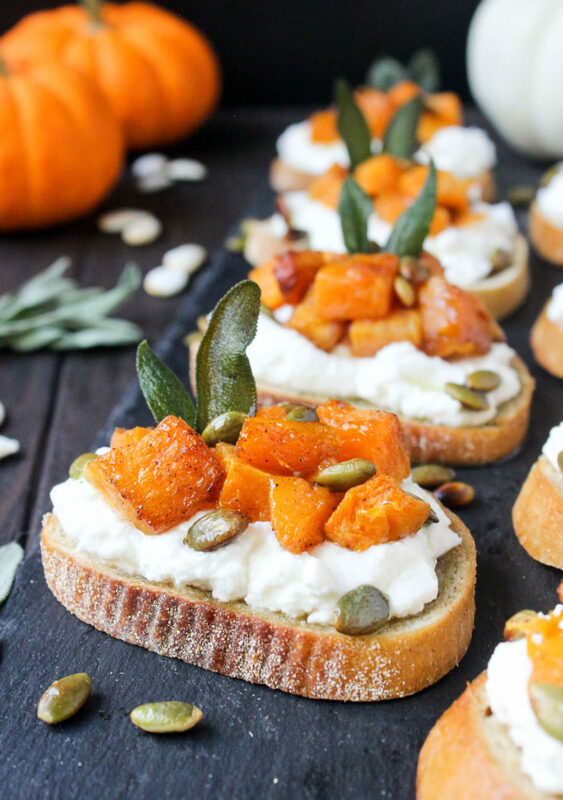 This combo is my butternut go-to because it brings out the very best this veggie has to offer. 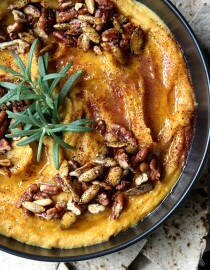 Specifically, it extracts the butternut’s sweetness, caramelizes it to perfection (so golden! ), and maintains a necessary hint of savory along the way. 40 minutes later and your kitchen will smell like a yankee candle. When the butternut has about 10 minutes left, slice up some fresh sourdough bread, gently coat it in olive oil, then toast simultaneously on the top oven rack. When both ingredients are ready, it’s time to party. 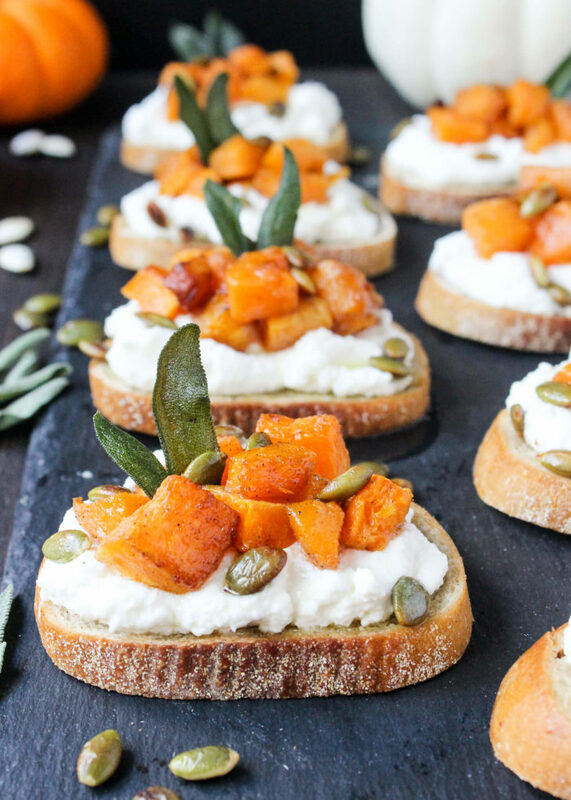 Plop heaping mounds of ricotta atop each toasted slice, sprinkle with caramelized butternut cubes, then drown in luscious truffle oil. This flavor trio alone is enough to make your toes curl (swear), but the added touch of sage + peptias really makes this a home-run. Together this is sweet, savory, creamy, crunchy, and SO damn comforting, it’s the perfect vegetarian bite for fall. 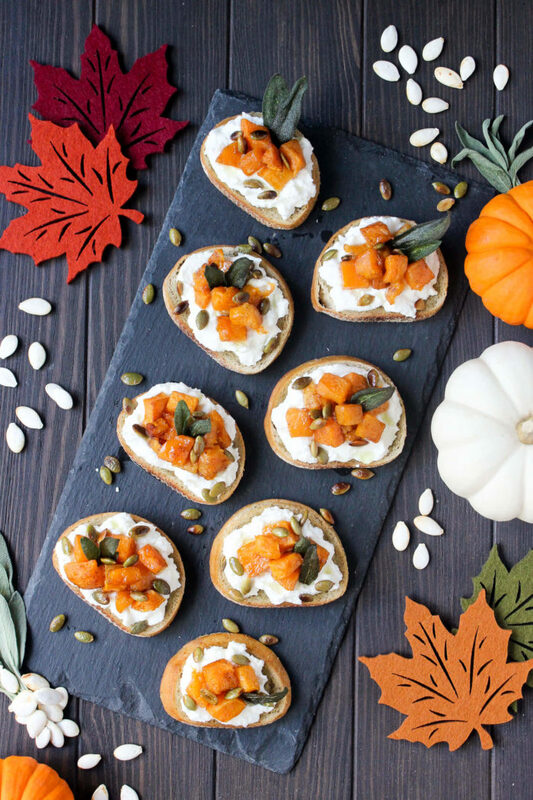 If you’re looking to enjoy this a few slices at a time, simply roast the butternut ahead of time, refrigerate, then assemble your toasts as needed. And this same strategy can be applied to making HUGE batches for entertaining, too! Preheat oven to 425F. Lightly grease a large baking dish with cooking spray. In a small mixing bowl combine the coconut oil, brown sugar, cinnamon, and salt & pepper, whisking well until smooth. Next, place the butternut squash in another, large mixing bowl, then pour over with coconut oil mixture. Stir ingredients with a wooden spoon until are cubes are evenly coated, then transfer to the greased baking dish. Roast on oven middle rack for 30 – 40 minutes until fragrant and caramelized. Meanwhile, with fifteen minutes of roasting time left use a pastry brush to coat the bread slices in a thin-film of olive oil, then transfer to a baking sheet. Toast on the top oven rack until lightly browned. 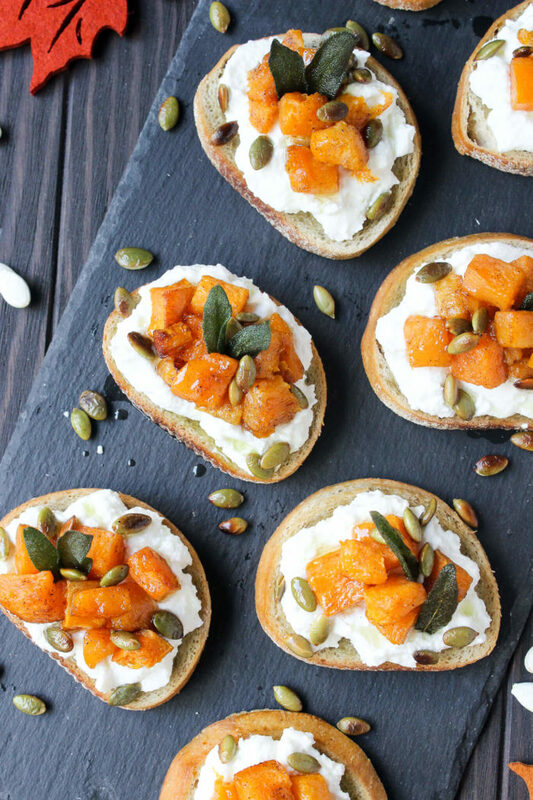 When ready, assemble the toasts with an even distribution of ricotta and caramelized butternut squash on each. 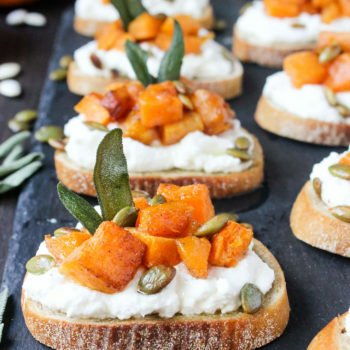 Drizzle with truffle oil, garnish with sage and pumpkin seeds, then serve! Hi there! 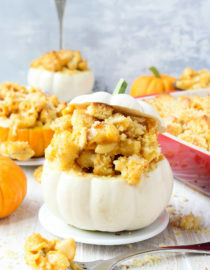 I love butternut squash and I’m so excited to try this recipe! 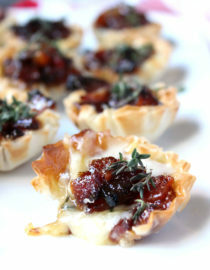 I’m trying out different appetizers for my family’s Christmas party during the fall. My mom is very allergic to certain fungi and has had a bad reaction to truffles in the past. Do you have a recommendation for a truffle oil replacement? Or do you think I could just leave it out and have the ricotta cheese plain? 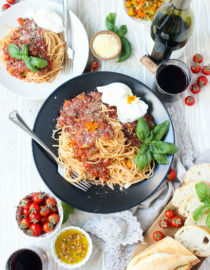 Is this served hot, cold or both? You mention refridgerating the squash then assembling the toasts as needed. It looks very yummy.